4/20 Sale! 20% off any selected item upon checkout on 4/20/2019! Live Music and free happy hour drinks at Ruidoso Gazebo Location! 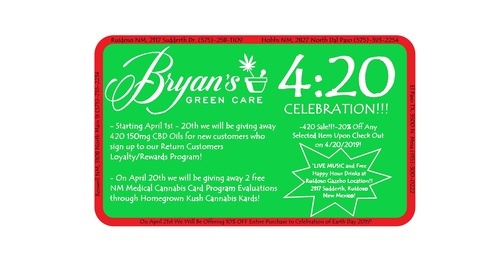 Starting April 1st - 20th we will be giving away 420 150 mg CBD Oils for new customers who sign up to our Return Customers Loyalty/Rewards Program. On April 20th we will be giving away 2 free NM Medical Cannabis Card Program Evaluations through Homegrown Kush Cannabis Kards!